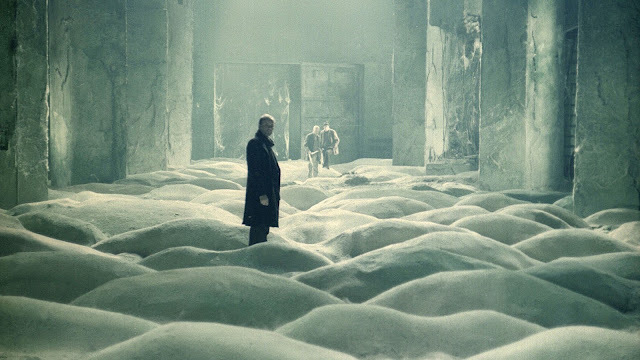 What to make of Andrei Tarkovsky's enigmatic science fiction masterpiece, Stalker? At once a haunting religious allegory and a chilling dystopian vision, Stalker is truly an experience like no other. Ostensibly a film about three men attempting to journey to the site of a purported alien crash, Stalker's eponymous character is a guide who takes travelers deep into the heart of what is only known as "the Zone," in order to find a fabled Room that is said to grant people's innermost desires. Along the way they face deadly traps and shifting passageways designed to thwart them on their way to happiness, and only the stalkers can see them safely to The Room. Is he a prophet, leading people to the promised land? Is he a false prophet, playing on their hopes and dreams? Is he just a misguided man with misplaced faith? Stalker dares not only to question religion's role in our world, but to pose the question - "even if our faith in God is in vain, was it still in service of a greater good?" Is a lie an evil even if it brings joy and hope? And what if, in the end, it turns out to be true? Shot in gorgeous, golden sepia, and later (in the Zone) in lovely, muted color, Stalker is a masterwork like no other. The new Criterion Blu-Ray is absolutely flawless, bringing each golden shot to breathtaking life. Like all Tarkovsky's films, it is a slow, deliberate work. Yet not a shot or a sound is wasted (the use of sound here is especially stunning). It's like something out of a dream, guiding us through a haunted, desolate landscape that eerily presages the Chernobyl disaster that would occur seven years later. It's a mesmerizing, utterly un-categorizable work that is undeniably the work of a master artist at the peak of his powers. STALKER | Directed by Andrei Tarkovsky | Stars Aleksandr Kaydanovskiy, Anatoliy Solonitsyn Nikolay Grinko, Alisa Freyndlikh, Natasha Abramova | In Russian w/English subtitles | Now streaming exclusively on FilmStruck! Also available on Blu-Ray and DVD from The Criterion Collection.